This vintage Wittnauer chronograph from the 1950s is perfect for inspiring someone for vintage watches. At a glance you can feel the unparalleled appeal of this vintage watch. At the beginning of the 20th century, the Wittnauer manufactory developed its reputation as a reliable manufacturer of timepieces. Wittnauer produced timepieces for military aviation during the First World War, which enabled the manufactory to gain valuable technical know-how. Due to their reliability, the Wittnauer watches soon became part of the narrow selection of researchers, pilots and navigators. Today, the Wittnauer brand is under the leadership of Bulova and practically no longer exists. But for vintage collectors, Wittnauer is a well-known brand that is deservedly respected for its prestigious history. The impressive highlight of this particular Wittnauer chronograph is its exceptional condition. This watch is over 70 years old and has kept its original and authentic look. The case has few signs of wear and seems to be unpolished or slightly polished. The black gloss dial is absolutely flawless. The Arabic numerals and the hands are filled with original radium luminescent material. We were able to prove the originality of the radium substance with a Geiger counter (see pictures). Although this chronograph dates from the 1950s, it meets today's standards with its 38mm diameter. On the wrist, the watch impresses with its clear and sporty-elegant dial design. Three sub dials, Arabic numbers and a tachometer scale decorate the black gloss dial. The sub-dials of the chronograph have arrow-shaped hands. This Wittnauer chronograph is powered by the rare Valjoux 71 movement. It is based on the Valjoux 22 and has an additional 12-hour totalizer at 6 o'clock. Other well-known watch brands such as Heuer have fitted the Valjoux 71 movement in their watches in the 40s and 50s. The watch comes with a dust cover which protects the movement (see pictures). 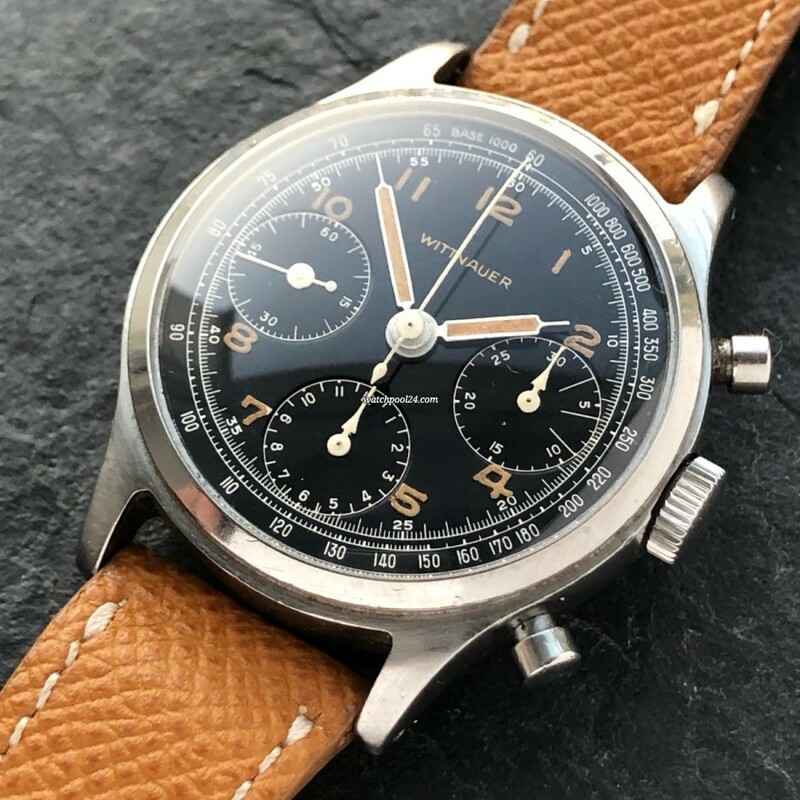 Excellent movement, unique vintage look and an exceptional condition make this Wittnauer chronograph a first-class collector's watch.